Need a place to park? Swing around, back in, or drive up to your new ROK Garage. It's big enough! Wider than your bumper & taller than any wheeled vehicle so it fits all ROK Vehicles. This garage includes sturdy beams & a high roof to cover your vehicle & protect it against the elements. Makes parking fast and easy. 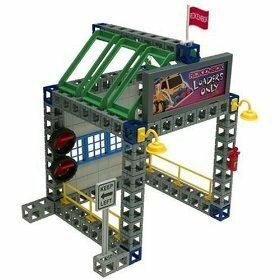 Build a ROK Garage for each of your Rokenbok Vehicles! Includes 5 different custom signs. Choose from: RC Forklift, RC Speedster, RC Sweeper, RC Skip Track or RC Dozer. A cool addition to your Rokenbok World!